LiveRez CEO Tracy Lotz accepts the Boise Chamber's 2015 Travel Industry Excellence Award. 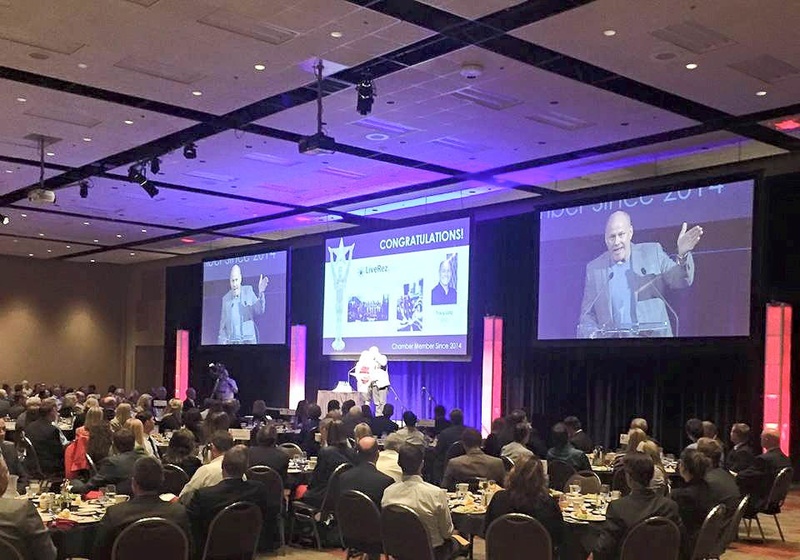 Today LiveRez won the Boise Metro Chamber of Commerce's 2015 Travel Industry Excellence Award. This is the second year in a row the company has been a finalist for the award, which is given to a chamber member company that "has made significant contributions in enhancing Idaho's travel industry through recreational opportunities, transportation, lodging options, tourism, or other means." Other finalists this year were AAA of Idaho and Enterprise Holdings (the parent of Enterprise and National rental car companies). LiveRez CEO Tracy Lotz accepted the award and gave a rousing speech, explaining how the company has grown over the years and at one point calling LiveRez the "honey badger" of the vacation rental industry. You can watch his speech below.